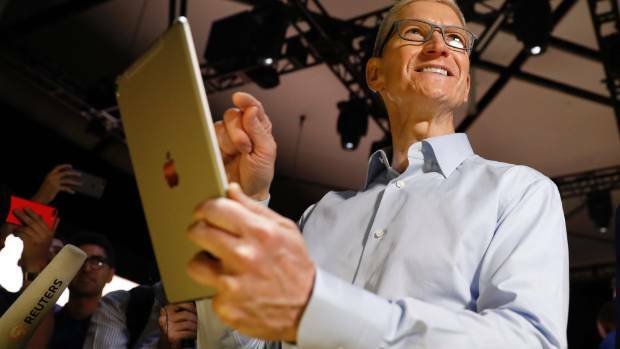 Tim Cook holds an iPad Pro after his keynote address to Apple’s annual world wide developer conference. It’s taken a while but Apple is finally following through on its leader’s desire for iPads to replace computers. His vision may finally come to fruition with the release of iOS 11, the new iPad operating software that was announced on Tuesday. When it’s released later this year (usually about September) an iPad will suddenly look very much like a Mac computer. It has less to do with the new 10.5 inch iPad Pro model and more to do with the way iOS 11 will let you use an iPad. You will now have a dock for all your apps (just like a Mac does), a new Files app (similar to what a Mac has), and the ability to drag and drop apps anywhere on your screen. These features will turn an iPad into less of a toy and more of a tool. The hardware in the new iPad Pros will help too. There’s also a new smart keyboard and that, when paired with the Apple Pencil, makes it easier to use an iPad Pro like a computer. And then there’s the price. The new 10.5-inch iPad Pro with 256GB of storage costs $1259 while the 12.9-inch model is $1459. The keyboard adds $259 and the pencil $159. It’s not cheap but it is still about $1000 less than the new version of the MacBook Pro laptop. The iPad is also much lighter (470g), you don’t need to travel with a heavy charger, can record 4K video and works better with your iPhone (you can use the same apps). If you use your laptop or desktop for just web browsing and other light work, then your current Mac computer may be your last. However, iPads still have some shortcomings. If you type a lot the on-screen and physical keyboards are limited compared to a laptop. The same goes for heavy editing work or anything that requires detailed use of a mouse. But these new changes will give you options on what device to buy for your needs and may even save you money.